Trustees for the Employees Retirement System of Texas voted Wednesday to decrease earnings assumptions for its $26 billion trust fund, a rare move that could have major implications for the state budget and the retirement system’s beneficiaries. In a 4-2 vote, the board cut the fund’s expected annual rate of return from 8 percent to 7.5 percent, reflecting gloomier market conditions and other factors straining the system. The board also voted to revisit the rate in two years. Agency staffers and some trustees had pushed for a rate as low as 7 or 7.25 percent, but the board settled on the slightly higher projection. Retirees and advocates fear the Legislature will respond by shifting more financial burdens onto the system’s beneficiaries, either by forcing current employees to chip in more for their future pensions, cutting benefits or closing off the fund to future retirees. The Employees Retirement System handles benefits for about 240,000 active and retired state employees, elected officials, law enforcement and prison officers and judges. On average, beneficiaries receive $1,600 per month, a figure that hasn’t been adjusted for the soaring cost of living since 2001. Lowering the expected rate of return will not affect how much money flows into the retirement system, but it will dramatically alter its long-term balance sheet. Under current assumptions, the fund is projected to grow large enough to cover its liabilities within 35 years. Under a 7.5 percent expected rate of return, the fund would never be expected to grow large enough to provide full benefits to retirees into the future, and without intervention, would be depleted by 2070. Retirees in recent weeks flooded trustees with emails expressing anxieties about their future benefits and urging trustees to protect the status quo on expected rates of return. Several voiced their concerns in public comments ahead of Wednesday’s vote. Trustees said they understood retirees’ concerns, and they were only lowering expectations to protect the long-term health of the system. Craig Hester, an investment manager and the board’s chair, described a “perfect storm” of factors putting pressure on the retirement system over the past two decades, including a national recession, an aging workforce, benefits changes and chronic legislative underfunding. A host of other states have recently lowered their predicted rates of return for public pension funds, a change some financial analysts say is needed, largely because low interest rates have limited earnings for the type of low-risk investments that pension funds generally favor. Hester and other trustees agreed that the Legislature had shortchanged the retirement system’s fund — and Texas workers more broadly — over the years and could struggle to recruit talent if they fail to boost salaries or benefits. Donnell said she doubted that current retirees would be affected by any looming adjustments to benefits. Texas tended to fully fund the Employees Retirement System throughout the 1990s. But a turn-of-the-century recession triggered a long streak of chronic legislative underfunding that strained the system. In 2015, lawmakers sought to shore up the retirement system by increasing state and employee contributions by roughly 2 percent each. Texas law says state pension funds can’t adjust for cost of living unless the funds are actuarially sound — that is, they have enough money available to cover all liabilities even after increasing retiree payments. Even under an earnings projection of 8 percent, that wouldn’t have happened for 35 years. Labor advocates have pushing for a lump-sum cash infusion that could more backfill plug the funding gap and potentially allow for the cost-of-living adjustment. But even that could be tricky. The Texas Constitution says the state's contributions to pension funds can’t eclipse 10 percent, and the state is near that threshold. 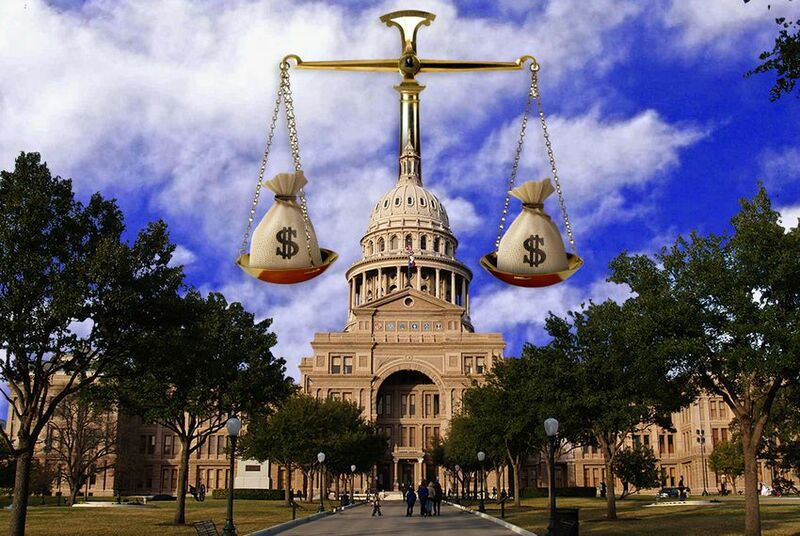 Legal experts disagree about whether such an infusion would count toward pushing Texas over that cap, and the idea is a nonstarter around the Capitol. There is one other option: Gov. Greg Abbott could declare the unfunded liability an “emergency,” giving lawmakers clear permission to chip in more money. Donnell said suggested lawmakers would be wise to chip in resources sooner than later, so they could grow over time.